First Bra Guide - Shopping for preteen lingerie doesn’t have to be a somber or serious experience. In fact, it can be loads of fun when you do it right. Even though some may think it's embarrassing or uncomfortable, with a few quick and easy tips it can be a great experience that’s enjoyable and memorable, for all the right reasons. We'll take you through the fundamentals of how to buy and fit your first bra, while adding a dash of fun and frivolity with these simple steps that take bra shopping from awkward to awesome. Anything in life is more fun when you surround yourself with people that you love, and shopping for teen lingerie is no exception. It will be infinitely more fun if you take your best friend along, or your mom or favorite aunt, or even your older sister for moral support. It’s way cooler to hang out with your favorite people than it is to be alone, and having someone older with you can also be really helpful, as they probably have some great tips to share. They can run and grab different sizes, suggest styles you might not have thought of on your own, and offer much needed advice, not to mention making the whole experience more enjoyable. A cotton bra in different colors trimmed with a bit of lace is a great first bra. 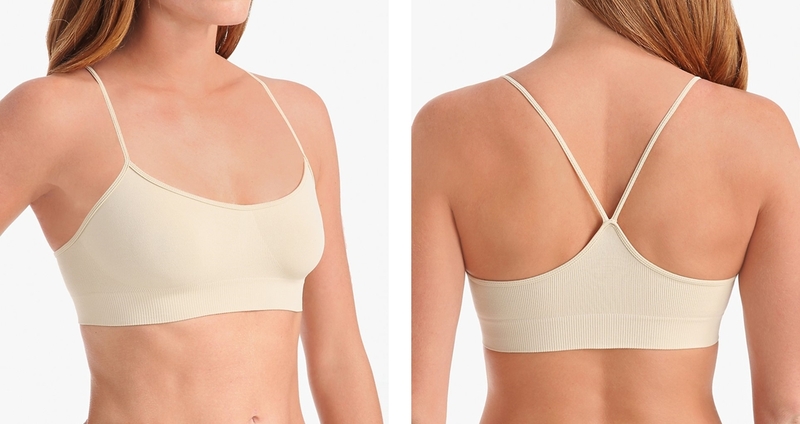 Soft and stretchy, cotton bras won't chafe against delicate breast tissue. Look for cotton blended with stretchy spandex for a comfortable fit. Blindly flipping through racks of bras can be majorly intimidating and stressful – more than a little stressful and definitely not a recipe for having a good time. Take the time to talk to a sales associate when you get to the lingerie store and ask them to teach you the basics of buying a great bra. Interacting with someone who really knows the ropes will make the experience way more fun. And, you’ll be able to choose bras with confidence instead of feeling overwhelmed. Sports bras are also a great option. They're made of a soft and stretchy cotton blend fabric with a wider elastic that rests comfortably under the breasts for an easy fit. These types of bras offer good support for everyday light to moderate activities, including physical education, jogging, cycling, yoga and dance. Despite what you may think, preteen and teen bras don’t need to be basic or boring. Even the simplest styles can be pretty, with a few of the right details and trims. Don’t forget to have a good time with beautiful lingerie – an important lesson to learn from the time you buy your first bra onward. One of the main bra shopping fundamentals is to find a style that looks great under any clothing that you want to wear. If you need to try a top on over bras in the fitting room, why not make it one of your favorite shirts or sweaters instead of a ratty old t-shirt? Or, opt for a basic tank top with your favorite skirt or accessories. Putting a little effort into your appearance will make you feel prettier and more confident, leading to more fun when shopping for bras for teens. After you’ve learned the ropes and worked hard to find your first bra, it’s time to celebrate your shopping adventure! Go out with your friends and mark the occasion, have a special lunch with your mom, or go out for ice cream with whomever your shopping partner was. Turn this special event into an even more fun time when you treat yourself and make it into an amazing day with great memories.